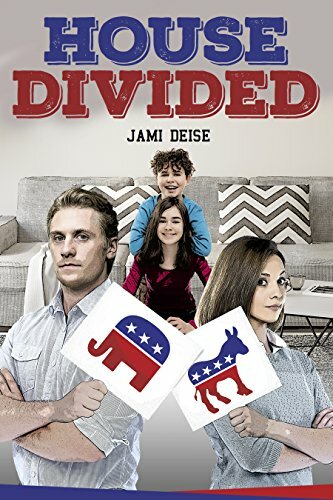 “…because like every other working mom in America, the logistics of day-to-day suburban life with school-age kids fell squarely on my shoulders.” (Kindle Locations 393-394). Erin and Jack are married with two kids. They both have careers. They have opposite political views. They can leave all the politics at work. That is, until Erin loses her job and Jack gets an amazing job offer – as the star of a very politically-centered show. The new money means Erin can be a stay-at-home mom, like Jack’s always wanted her to be. Erin never wanted to be a trophy wife, but jobs are slim for democrats. Home life is just as busy as work life, but without a career, Erin doesn’t really know who she is anymore. So many times during my read of this novel, I grew frustrated with Jack because Erin did all the work in the house! Gah! If Erin wants to have a career, she should be able to have a career! This book made me frustrated! Frustrated for Erin and her situation, how people treated her and thought about her, and how Jack disregarded her wants and dreams. My life is so different from Erin’s life. I learned so much about the chaos of working motherhood, stay-at-home parenting, living above your means, trying to keep up with the upper class, and so much more! This book had so many world building details and insights into the lives of these unique characters. I felt like I learned so much! This book was so entertaining! The dialogue was spot on. The writing style was immersive, eloquent, and smooth. The storyline made sense . The characters were detailed and interesting – flawed and everything. I loved this story and the writing style and can’t wait to read the next book from Deise. I received an ARC from the author and this is my honest opinion. This novel was published through Amazon Digital Services Inc. on 11/08/2017 and is available on Amazon here. ← Local Event Alert! Thrill the World Redmond Town Center, WA 10/28 at 3pm!